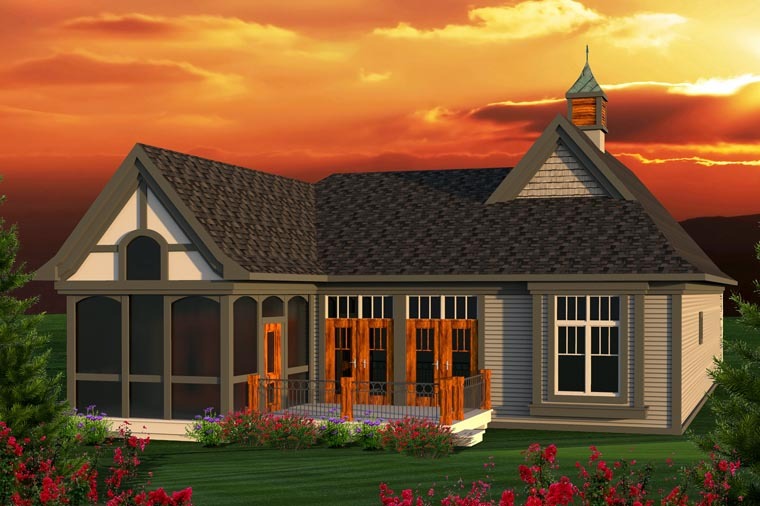 This quaint charmer of a plan has a country French flair that’s normally found on larger homes. At 1,625 square feet, every inch of this home is worked into an open concept floor plan to create the illusion of space. Exposed beams are found throughout the living area, which includes a spacious kitchen, great room with fireplace, and dining room. The master suite is located to the left of the entry and features a unique layout that includes high ceilings, his and hers walk-in closets, dual sinks and easy access to the laundry. A second bedroom is located to the right of the home off the entry for maximum privacy. A two-stall garage makes this home a perfect fit for many families. Question: Is there possible space above the garage for a sleeping loft? Answer: Yes you could get about a 13’X15’ space w/ 8’ ceilings. 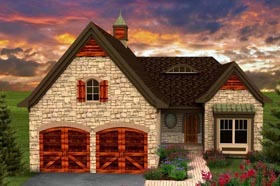 It would take some revisions to the plan, adding stairs in the garage.